Welcome to the 2019 WorldFirst Currency Outlook where our Chief Economist Jeremy Cook provides his predictions for major currencies in 2019. It is not a fashionable call to be optimistic when it comes to the AUD coming into 2019 and we will caveat our optimism by saying that the first half of the year could be a volatile couple of quarters; gains for the AUD may come easier from the middle of the year. The AUD, much like the NZD is exposed to both China and the US’s cycle of increasing interest rates, although the Aussie finds itself more exposed courtesy of higher household debt level on a relative basis and by the simple fact that it is a more liquid currency than its antipodean neighbour. The stories that drove the volatility in currency markets in 2018 don’t vanish as the fireworks go off on the Sydney Harbour Bridge and a new year rolls in. Chinese growth concerns, US/China trade spats, instability in emerging markets and wider commodity price compression will all have a part to play in the movement of the Aussie in the coming 12 months. Chinese demand for steel, and in turn Australian iron ore should remain solid with any demand that had previously been used for exports likely transposed into infrastructure projects. Similarly, natural gas exports should remain strong. There is the small matter of a general election in Australia this May which will always be enough to keep the AUD under pressure for a month or so, although we are not expecting a huge political upset. The Reserve Bank of Australia will continue to emphasise that interest rate hikes are more likely than cuts and whilst we see no change in rates in Australia for at least a year, an increase in wages will naturally drive expectations and the AUD higher. We anticipate AUD/USD trading between 0.70 and 0.76 in 2019. 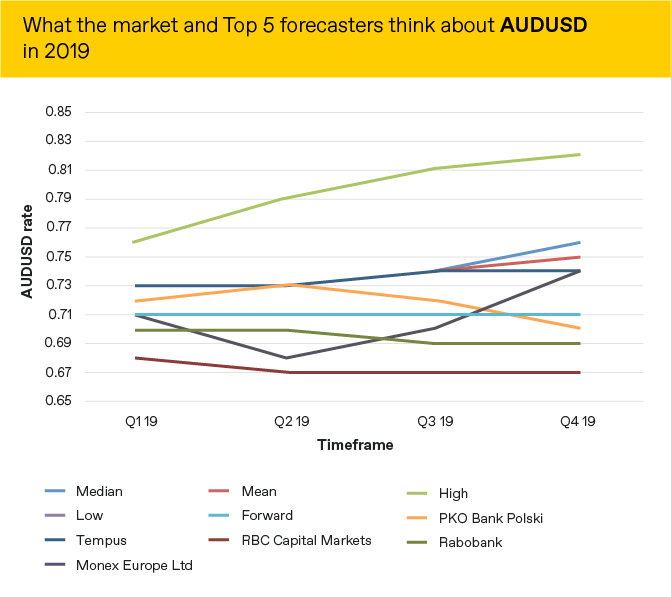 Market expectations of what will happen to the AUD versus the USD are below alongside the predictions of the 5 most accurate forecasters as measured by Bloomberg. Download our full guide which includes predictions for other major currencies including USD, EUR, GBP, NZD, CAD and JPY. Forward Contracts – lock in an exchange rate for up to two years. Firm Orders – Targeting a particular exchange rate? We will watch the markets for you and execute your transfer the moment your target rate has been hit. Rate Alerts – Set up a free rate alert and we’ll send you an email or SMS if your target rate is reached. 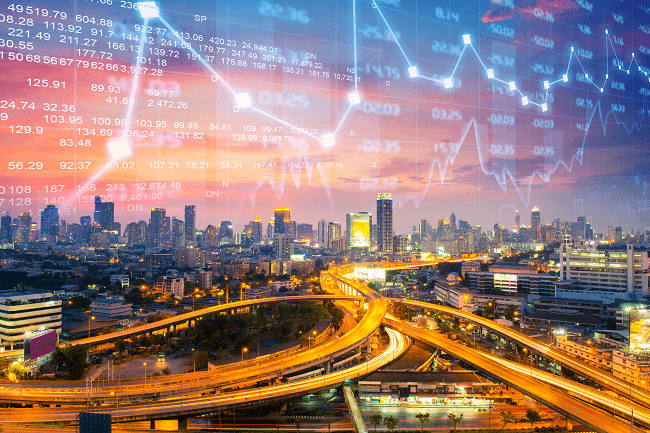 Daily Economic Updates – Keep abreast of what’s happening in global currency markets by subscribing to our Daily Economic Update. World Account – One easy-to-use platform, 7 currency accounts issued instantly for your business – USD, GBP, EUR, AUD, NZD, JPY and CAD. All pricing comparison data obtained and prepared by WorldFirst through online research and reflects daily rates as at the last update marked by time/date stamp.Based on transfers of AUD to GBP, AUD to USD, AUD to EUR, AUD to NZD and AUD to SGD (including inverse). Fees not included. Whilst every effort is made to ensure the information is accurate, you should confirm the latest exchange rates with WorldFirst prior to making a decision. The information published is general in nature only and does not consider your personal objectives, financial situation or particular needs and is not recommending any particular product to you.